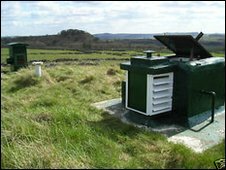 A nuclear bunker in Derbyshire has sold for £20,600 in an online eBay auction. The decommissioned Cold War bunker, built in 1959 into a field in the Peak District, attracted 42 bids and hundreds of hits. The bunker, which sits on a 2,756 sq ft plot, has lighting and a phone line and can be used as living accommodation for short periods. It was described by the private seller as "a rare opportunity to acquire a valuable piece of Cold War history". The bunker was built as a monitoring post by the Royal Observer Corps (ROC), amid the threat of nuclear attack, but decommissioned after the collapse of the Soviet Union. It is accessed via a metal hatch and shaft, and a 15ft (4.5m) ladder leads to two rooms - one for a chemical toilet and the other, of 15ft x 7ft 6in (4.5m x 2.3m), for the monitoring equipment. Two ventilation shafts are built in and much of the original equipment is still in place. The seller said: "The bunker can continue to be used as limited living accommodation for short periods or adventure holidays. "ROC posts rarely come on to the market, especially in such well preserved condition."